Here’s what I’ve been working on for the past little while. Just in time for Nintendo’s E3 press conference, I’m proud to unveil our Wii U Games Database! 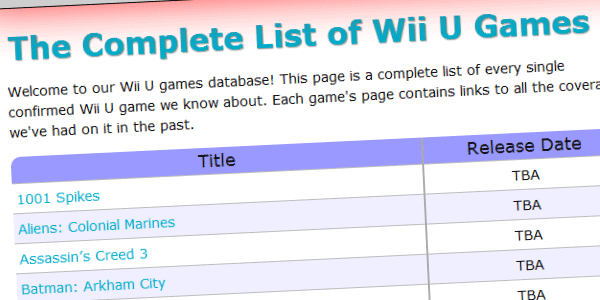 At the moment, it is little more than a list of Wii U games interconnected with all the articles, screenshots, and videos we’ve posted about them. But the core code powering the database is in place, and you can expect to see lots of changes and improvements to it over time. If there is anything in particular you’d like to see from the database, feel free to sound off in the comments and I’ll see what I can do. If you notice a missing game, release date, or other piece of info, please let me know about it as well. But even in its current state, it serves as a handy way to keep track of every single Wii U game in existence. Enjoy! Nice to see many nice games already, but would be great to see a collum that shows the Publisher/Developer for each game. Gives a better idea which companies already support the WiiU. Just added this, along with separate lists of games made by each developer! How does it look? It would also be nice to have a status against each game eg. ‘rumoured’, ‘announced’, ‘released’. Because it looks like theres a tonne of games on the list, but some of them are only rumoured. I think I’ll work on splitting up games with different statuses into different tables next. It’ll be nice to have separate lists of confirmed, rumoured, canceled, and released games. Nice! This database is awesome, Wii U Go!